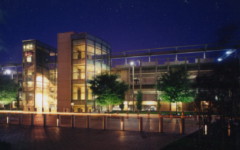 Parking Structure A serves employees of various office and support facilities on the PeopleSoft corporate campus. The exterior consists of cable-tensioned guardrails, precast concrete elements and a glass-enclosed stair tower. The exterior design complements the Phase I office buildings which were constructed concurrently with the parking structure. The lower level of the garage features a machine room for electrical transformers and emergency generators. The garage is fully equipped with fire sprinklers and a state-of-the-art security system which monitors the structure and surrounding surface parking.